The week-long Vedic Sammelan held at the ancient Zeashta Mata Mandir in Shrinagar, Jammu and Kashmir from 20 to 26th April 2012 in the benign presence of His Holiness Pujyashri Jayendra Saraswathi Shankaracharya Swamiji of Shri Kanchi Kamakoti Peetham culminated with Adi Shankara Jayanthi celebrations on the Vaishaka Shukla Panchami day at Shrinagar. Shri Adi Shankaracharya is credited with unifying our country through his own yatras across the country and also by establishing the practice of Kashi-Rameshwar and Chardham yatras that are prevalent till date. 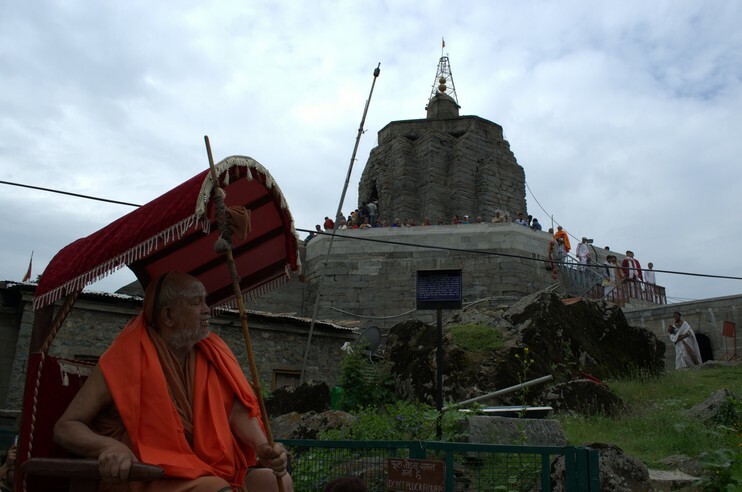 The celebration of Shri Shankaracharya Jayanthi at Kashmir by Shri Kanchi Kamakoti Peetham with the benign blessings of Their Holinesses re-emphasizes this unity and oneness of our country and the prevalence of Sanatana Dharma. His Holiness Pujyasri Jayendra Saraswathi Shankaracharya Swamiji visited the ancient and revered Adi Shankaracharya Hill Temple in Shrinagar accompanied by devotees. His Holiness performed pujas and abhisheka to the Shiva Linga there amidst the chanting of Shri Rudram and chants of Jaya Jaya Shankara Hara Hara Shankara - Kanchi Shankara Kashmira Shankara. His Holiness visited the cave adjacent to the temple, where Shri Adi Shankara performed penance. Avatara Ghatta Parayan was performed and Adi Shankara Stotras were chanted at this holy shrine. The Shankara Jayanthi celebrations continued at the Zeashta Mata Mandir. Special Poojas and Abhishekha was performed to the utsava vigraha of Adi Shankaracharya. The Avatara Ghatta Parayanam was performed, followed by Abhishekam and Pujas. His Holiness performed the Vigraha Pratishta of Shri Adi Shankaracharya adjacent to the Shiva Linga in the Zeastha Mata Mandir. Vedic Scholars, Veda Patashala Students and devotees from various parts of the country took part in these celebrations and received the anugraha and blessings of Pujyasri Adi Shankaracharya Swamiji and Pujyashri Jayendra Saraswathi Shankaracharya Swamiji. The Shankara Jayanthi celebrations continued in the evening at the Sher-E-Kashmir auditorium. The programme started with Swasti Vachanam, Totakashtakam and Guru Vandanam by Shrimatam Vidvans. Eminent Scholar Shri Abhyankar Shastri from Aditya Pratishtan, Pune gave a discourse on Advaita Philosophy.Shri Acharya Govindgiriji from Maharshi Veda Vyas Pratishtan, Maharashtra spoke on Bhakti Bhava in the works of Jagadguru Adi Shankaracharya. A book titled "Vaidika Mantra Kalpa Lata" was released by His Holiness Pujyashri Jayendra Saraswathi Shankaracharya Swamiji and the first copy was received by eminent Kashmiri Pandit Scholar Shri Omkarnath Shastri. The book, a part of the rich ancient Kashmiri literature, was brought out by Shri Venkateswara Vedic University, Tirupati as per the benign directions of His Holiness. The mantras from the Vaidika Mantra Kalpa Lata were recorded and brought out in the form of a Compact Disc along with introduction in English and Kashmiri. The CD was released by His Holiness and the first copy was received by Shri Abhyankar Shastriji. Stotras of Adi Shankaracharya, a book published by Adi Shankara Advaita Research Centre, Chennai was released by His Holiness and the first copy was received by Shri Acharya Govindigiriji. A Special Sanmaan was given to the eminent Kashmiri Pandit Scholar Shri Omkarnath Shastriji, who is running the Pandit Premnath Sanskruti Shod Sansthan. In His Anugraha Bhashan, His Holiness Pujyashri Jayendra Saraswathi Shankaracharya Swamiji highlighted the important parts of the life of Shri Adi Shankara, right from his birth onwards, and the message of Shri Shankara. Harati was performed along with rendition of Gauri Stuti by Shri Omkarnath Shastri. The programme concluded with singing of Maitreem Bhajata. This was followed by Cultural programmes by Raja Rajeshwari Natya Kala Kendra led by Shri T. Kalyana Sundaram.